The 9 September parliamentary election in Norway is fast approaching. 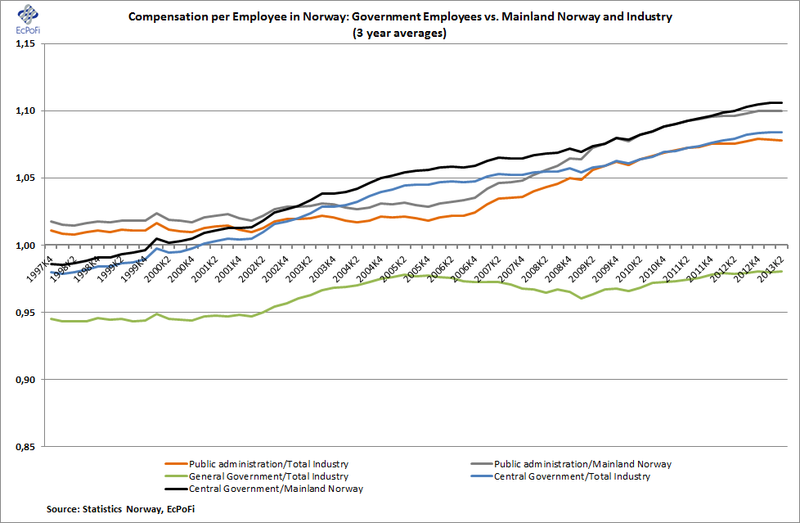 Following four years of hard salaried work by on average 2.5 million registered employees (only about 50% of the total population) and a period during which the government collected a total of almost NOK 3 trillion (USD 498 billion) in taxes, duties and VAT, the race is now on for which special interest groups and voters can receive part of that money. And to ensure they receive a bigger share going forward. And people will therefore, as they've always done, vote for the party that promises them what they want. In most cases, these wishes and promises are not free, they cost money. So, in simple terms, democracy is government collecting tax payer money in a pot, of which it spends a big chunk on running costs, for then to redistribute whatever is left over to the citizens. Net result is that society as a whole, ceteris paribus, is worse off, the difference being the costs of running the government as this consumes wealth, rather than generate it. This is why I refer to it as democrazy. It's a greed game, a game of receiving additional money that a recipient didn't earn in the first place. The way democracy works these days, not only in Norway but in most western world countries, government wins no matter what party wins the election while the private sector lose. In Norway, even though the overall tax burden is very high, the government is nonetheless unable to finance all its spending with it. So it finances the resulting mainland deficit with revenues from oil and gas. Now, we're not about to see the end of government any time soon in Norway. But it is crucial that the size of government and its spending is significantly reduced as government consumes way too much of the wealth generated in the private sector and off-shore. This makes Norway as a whole worse off than it otherwise would be. This is why these elections really should be about allowing the private sector to become substantially stronger as this is where wealth is generated. To achieve that, among other things, the bloated government needs to shrink, and shrink dramatically. Instead, the opposite has been happening for many years in Norway, and more so than ever before during the last five years. As a result, government employees is increasingly becoming better off than those working in the private sector. 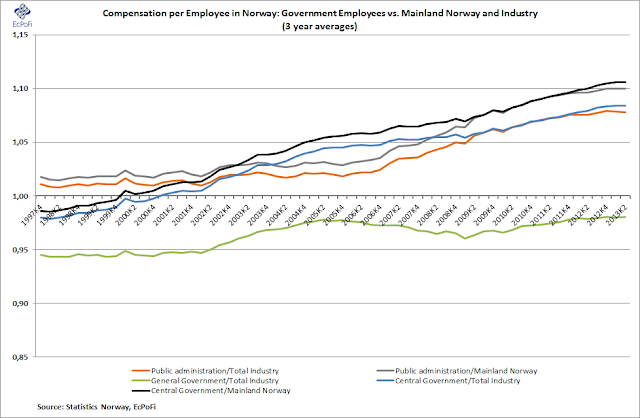 The chart below depicts how compensation in public administration and central government has outpaced that for mainland Norway and industry. The private sector needs to wake up (apologies to those that already have) and realise this before the election. This election should therefore be about how to make the private sector substantially stronger and to shrink the size of the bloated government. Hopefully the scale of the greed game will be smaller next time around. I don't think it will however. See here and here for more on government spending and politics in Norway.